Ya Jagoff!!! | The incident got carried way out of line because of my IBS ?? Well… if you have irritable bowel syndrome and have been stuck in traffic trying to rush home and or to find a public toilet over which you can “hover,” you kind of get the feeling that 69-year old Henry Weaver felt as another driver pulled out in front him. But…. 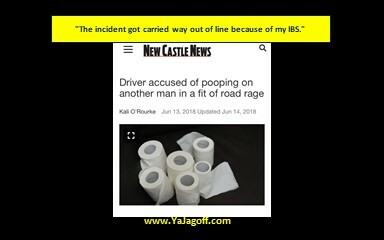 when he decided to drop trow and release his IBS issue on the other driver’s leg… well…..that’s a bit much, would ya say? So “Weav” and another guy, got in a verbal battle after stopping their cars to argue. Weave had to poop. He was also angry so…. …. so…….. um…. so…. yep… he pooped on the other guy’s pant leg! See full story here in the New Castle News. The best part…”Weav” got upset because the other driver LEFT!!! “”He didn’t say anything. He just got into the car, drove off and called the police.” Haaaaa.. what else would anyone do… except for the beat the living @#$@#! outta ya! Thank goodness he didn’t do that! Hell, if it was me, I would have run to the closest hospital sterilization lab! At this point, don’t know about any charges being filed but, we know that “Weav” is embarrassed. Well, thank gawd he got to THAT point of his IBS-display-grieving timeline! Weav… we understand that guys your age (69) shart sometimes. But this? Using IBS as a defense mechanism? We’d all prefer that you take a boxing or kicking boxing class so that the next “angry driver” story you get in, we’re talking about you giving the other driver a bloody nose or something like that… Ya Jagoff! Thanks to @PghsportsKipper for the heads up on this!!! Previous articleYaJagoff Podcast / Shalieve It’s a Good Podcast!